An attempt to answer the question of Determinism vs. Underdeterminism in Scientific Change which states "Transitions from one state of the mosaic to another are not necessarily deterministic. Scientific change is not a strictly deterministic process." Scientific Underdeterminism theorem was formulated by Hakob Barseghyan in 2015.1 It is currently accepted by Scientonomy community as the best available theory on the subject. The Duhem-Quine thesis on its own does not directly support the Scientific Underdetermination theorem – it could be that there is no rational way to choose what to re-evaluate in light of a contrary experience, but that scientists nonetheless follow certain rules. Philosophers like Feyerabend, Lakatos, Kuhn and adherents to the SSK view would contend that there are extra-scientific factors that affect the choice of what to re-evaluate, and that this in turn causes underdeterminism of scientific change. Feyerabend and Lakatos believed that the difference between successful and unsuccessful theories may lie not in the factual content, but in the skills of adherents in advocating for their chosen theory.2 SSKers would suggest a whole host of potential factors in how we decide between theories when experiencing conflicting evidence, including but not limited to “career interests, political affiliations, intellectual allegiances, gender biases,”2 etc. All this is to say that the identification of these factors indicates that these thinkers would acknowledge that there can be things outside the scientific mosaic that affect its evolution, and that the evolution is not predictable based on scientific considerations alone – that is, they would accept the thesis of scientific underdeterminism. Scientific Underdeterminism theorem (Barseghyan-2015) is an attempt to answer the following question: Is the process of scientific change a strictly deterministic process? Will two unconnected communities experience a similar historical series of changes in their individual mosaics? This deductive inference occurs as follows. The theorem is the consequence of two related theses: that of underdetermined method change, and that of underdetermined theory change. 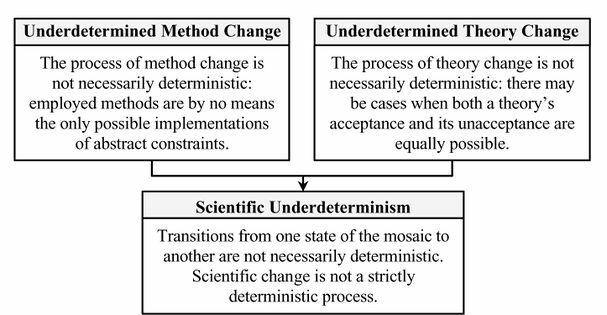 Since method change and theory change are exactly the transitions in the scientific mosaic, showing that neither method change nor theory change is deterministic is sufficient to imply the Scientific Underdetermination theorem (SUT). The underdetermination of method change follows from the 3rd Law: “A method becomes employed only when it is deducible from some subset of other employed methods and accepted theories of the time.” As a result of this law, a method can be employed in two ways: either it strictly follows from other accepted theories and employed methods, in which case the change is, in fact, deterministic, or it implements the abstract requirements of some other employed method. In the latter case, the change is underdetermined since abstract requirements can give rise to many different implementations. As a concrete example, we have an accepted theory that states, “when counting the number of living cells, the resulting value is acceptable only if it is obtained with an ‘aided’ eye.” A number of different methods can implement this abstract requirement, like the plating method or the counting chamber method.1p. 198 Thus the method is underdetermined by the abstract requirements, so the process of method change implementing these requirements is not deterministic, which is exactly the statement of the underdetermination of method change. The underdetermination of theory change comes from the 2nd law and the possibility of inconclusive theory assessment. The 2nd law states that “In order to become accepted into the mosaic, a theory is assessed by the method actually employed at the time”. This assessment can result in conclusive acceptance, conclusive rejection, or it can be inconclusive. In both conclusive cases, the theory change is deterministic, but if the theory assessment is inconclusive, then the theory can be accepted or rejected. So the process of theory change is not necessarily deterministic, since it is, in fact, possible for assessment to be inconclusive. The question of whether there actually exist cases of inconclusive theory assessment is a task for the history of science, and is irrelevant to our discussion. These two theses combine to form the SUT, since changes in theories and methods are all the transitions that occur in the scientific mosaic, and we have seen that the underdetermination of theory and method change follow deductively from the 2nd law, the 3rd law and the possibility of inconclusive theory assessment. a b c ↑ Stanford, Kyle. (2016) Underdetermination of Scientific Theory. In Zalta (Ed.) (2016). Retrieved from http://plato.stanford.edu/entries/scientific-underdetermination/. a b ↑ Gillies, Donald A. (1993) Philosophy of Science in the Twentieth Century. Blackwell. ^ ↑ Quine, Willard van Orman. (1951) Two Dogmas of Empricism. In Quine (1953), 20-46. This page was last modified on 11 March 2018, at 21:37.